With travel season fast approaching, you may be ready to book those plane tickets to somewhere warm and exciting. But you may be hesitant if you’ve never flown with a baby or toddler who still needs a harnessed car seat. You’ve already got half a dozen suitcases, a diaper bag, a purse and maybe even a laptop or two. Carrying around a car seat is an extra burden. Plus, it may not fit in the airplane seat, and you may have never installed one on an airplane. Parents have a lot of questions about this. Here are some answers. 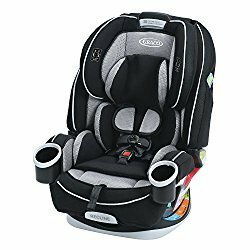 FAQ #1: What FAA-approved car seats are the best to use? Fortunately, many car seats on the market, except backless boosters, are approved for airplane travel. To be sure, look for the FAA-approved sticker on the car seat and in the instruction manual. These are the ones we recommend most. There is also a portable travel harness specifically for airplane use. Avoid rental or borrowed car seats if you can. They may be worn, outdated and since you’re not used to them, there’s a greater risk of improper installation. FAQ #2: Does my child really need a car seat on a plane? The short answer is no. The FAA does not require children under the age of 2 to be in a child restraint. They may be held on your lap instead, usually free of charge. However, the American Academy of Pediatrics warns parents that it’s much safer to use an FAA-approved car seat instead. Turbulence, while often not a major concern, can be extreme and does cause injuries in some cases. In those occurrences, your child can easily fly out of your lap. In a survivable crash, they could be crushed against you or flung out of your arms. While car seats are the safest way to go in flight, you will have to buy an extra ticket for the little one since they’ll need their own airplane seat. Many airlines such as Southwest now offer cheaper “infant fares” which won’t hurt your budget as much. Note: US airlines are required to allow child restraint use for children under 2, but the same doesn’t apply to all international airlines. Call the airline or go to their website to find more info. It does seem ironic that while the law says everything in the cabin must be secured during taxi, take-off and landing, children under 2 are the exception. Why? 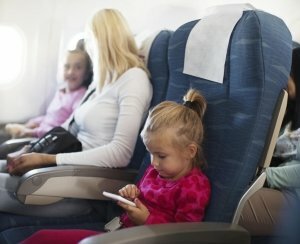 The FAA did studies that found if they forced families to buy an extra ticket for a baby, they would likely drive instead. Statistically, driving is much more dangerous than flight. FAQ #3: How can I tell if the car seat will fit on the plane seat? Even if FAA-approved, there’s no guarantee that your seat will fit on a specific plane. Check your seat’s dimensions and compare that against those of the airplane seat. Since you should do this before you fly, you’ll have to try to find this info without measuring the plane seat. Call the airline or check websites such as seatguru.com for the best estimates of seat dimensions. 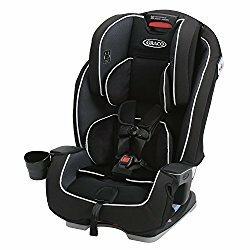 Car seat widths vary a lot, from 17 – 21 inches, more or less, as do the widths of plane seats, so research is key to make sure you’re not left with a useless car seat on the plane. FAQ #4: How do I install our car seat on a plane? Rear-facing seats will install exactly as you do in your car. Slip the lap belt through the belt guides in the seat, latch, and tighten. It will hinder how much the passenger in front of the baby can recline. So either try to seat another family member there or tell the passenger that your baby sleeps a lot better like that and won’t kick the back of the seat. Recline the back of the airplane seat. Insert the seat belt through the car seat’s belt path. Be sure the buckle flap is facing the seat back when you buckle it so you will be able to release it when you land. Tighten it up and return the seat back to its upright position. Note: To avoid blocking exit access, you must install in a window seat or middle seat of a middle row and not in an exit row. FAQ #5: What happens if my car seat doesn’t actually fit in the plane seat? The FAA requires the airline to find an appropriately sized seat in the same service class. You may have to be separated from other family if this happens, or other passengers may have to move from their seats. To avoid those hassles, make sure you’ve researched seat sizes and have bought a car seat that’s as compact as possible for air travel. Worst case scenario is that you’ll have to check the car seat and hold the baby on your lap. FAQ #6: What if the flight attendant tells me that the car seat isn’t allowed or instructs me to install it incorrectly? Flight attendants screw up sometimes just like everyone else. They may tell you to put your rear-facing seat forward, for example, which is wrong. The best solution for any misunderstanding is to be prepared with the facts. Print out the FAA rules that apply to car seats or have it saved on your phone. Also bring proof that your seat is FAA-approved. Polite but firm is the key in these situations. If you still get pushback, ask for another flight attendant to confirm or ask the attendant to consult his or her own flight manual. If this still doesn’t sway them, don’t lose your temper or you’ll get thrown off the plane for not following crew instructions. After the flight, be sure to complain to the airline or other customer advocate so that the crewmember can be educated or disciplined, depending on the airline policies. FAQ #7: Can my child sit in a booster seat on the plane? It depends on the type of booster. Backless boosters are not approved since they require a shoulder belt and airplane seats have only a lap belt. 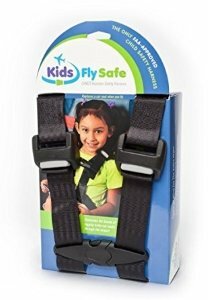 High back boosters with harnesses that are labeled FAA-approved are allowed. However, boosters with backs are pretty bulky and hard to move around. Since most children who are old enough to ride in boosters can sit in their own plane seat without a child restraint, you probably won’t need to use it anyway. If you’ll be using a rental car at your destination and would like to use your booster seat in the car, just check it along with your other baggage. FAQ #8: Are there child restraints other than a car seat we can use on a plane? Yes! The Child Aviation Restraint System, or CARES is a portable harness system suitable for kids at least 12 months old who weigh 22 – 44 pounds. It’s actually the only FAA-approved alternate child restraint and is great for frequent-flying families. At only 1 pound, it comes in a 6-inch bag which can easily be stowed in your carry-on bags. 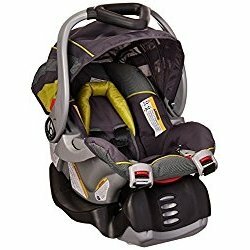 It’s made of seat-belt material and works like a 5-point car seat harness. Lower the tray table of the seat behind your child. Loop the harness over the seat back. Adjust the loop height to be at or slightly above the child’s shoulders. Tighten and return tray table to upright position. Fasten in your child, adjusting the shoulder straps and tightening as you would in a harnessed car seat. Loop the airplane lap belt through the harness and buckle. 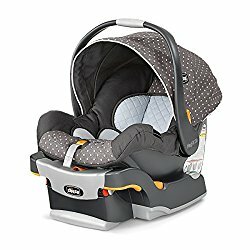 While the CARES is a good alternative for lugging around a car seat, it might not be that comfortable for a child who’s at or near the minimum age for use (12 months). At this age, they’re used to being more reclined in a car seat, so napping can be difficult because they’ll tend to slouch. 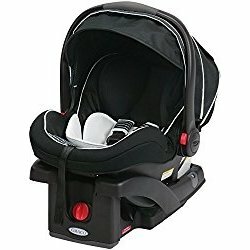 There’s also no strap between the legs as you’d have in a car seat, so wiggling little ones might keep sliding down the seat. Be prepared to adjust his seating position often, tighten up the shoulder straps, or wedge a pillow between him and the arm rest. FAQ #9: What if I’m traveling alone with my baby and can’t carry a car seat around the airport? If your car seat is part of a travel system with a light stroller, that should help. Otherwise, there are rolling car seat carriers specifically designed for use in airports. You’ll probably need to check it at the door of the plane, however, so be prepared to ask for help with carrying your car seat to your plane seat if necessary. FAQ #10: What are other ways to make flying more comfortable and enjoyable for my child? When choosing your flight, look for flights that aren’t that full by looking at the seating chart online. While you can’t be sure of how full it’s going to be, you’ll be more likely to find a good spot for your child’s car seat. Book your flight for nap or bedtime. Your child may sleep quietly through the entire flight if you’re lucky. Try to reserve a full row to yourselves, or at least an aisle and window seat if you don’t have assigned seats. Passengers aren’t likely to choose the middle seat between you, so you’ll have more privacy. Arrive early and talk to flight attendant to get the best seating options. Bring a birth certificate/proof of age for your child if they are under 2. Bring extra diapers, water, & snacks. Bring toys, books, & other things that aren’t noisy to keep them busy. Dress your child in layers – planes can be hot or cold depending on time of year and number of passengers. Wear a nursing shirt. If your child is still nursing, it will make it a lot easier to discreetly feed the baby during the flight. Plus, it helps with air pressure changes that can hurt their ears. Bring a pillow for comfy nursing. If your child is in a CARES harness or unbuckled during a long flight, it’ll be great for napping too. 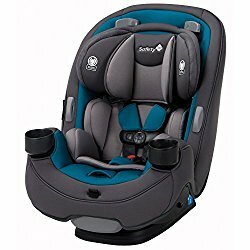 With some good planning and research, you’ll find the perfect car seat for your flight and will be prepared for a fun and relaxing plane trip with your baby.